A note from Jen: I love florals. I love to have them around the house, and I really love to photograph them! 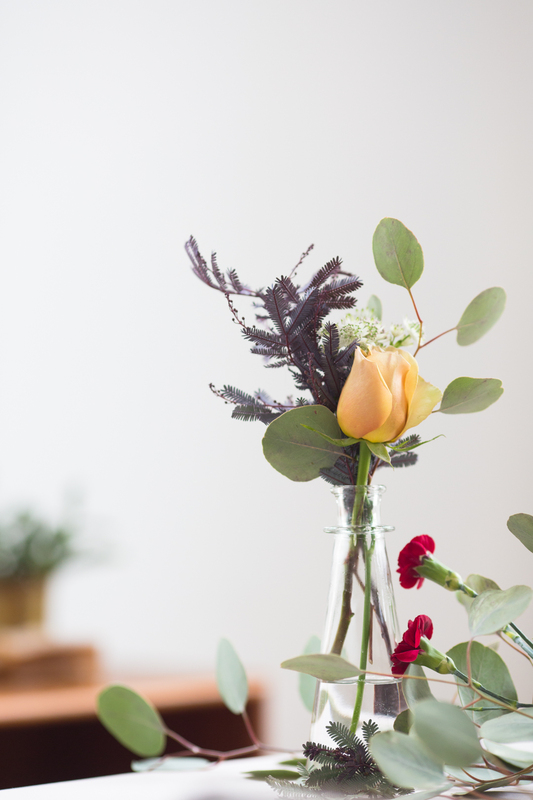 Tara Chapman of Forgather Floral Co. and I collaborated to bring this post to you. Tara is an amazing floral designer and shares studio space with me at 96 Mary Street in downtown Barrie. 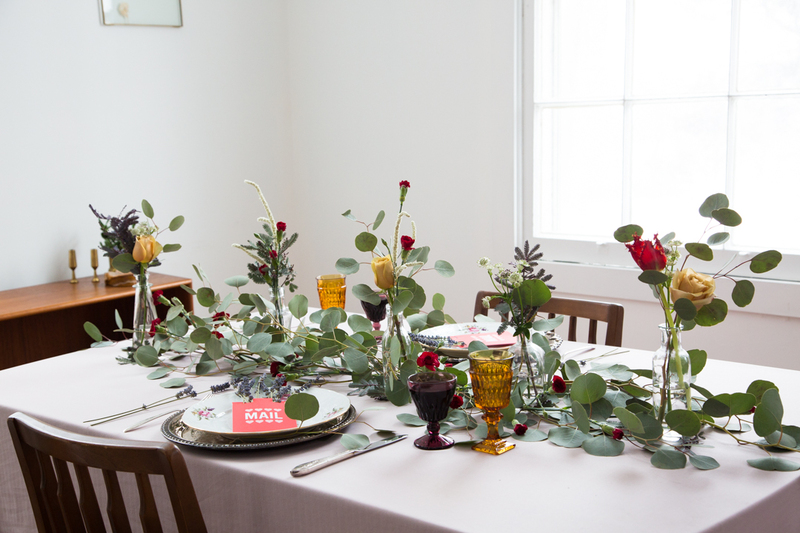 This table setting might not scream “Valentine’s day” to most, and I think that’s what makes it all the more romantic. My idea of romance is showing the one we love how well we know them. 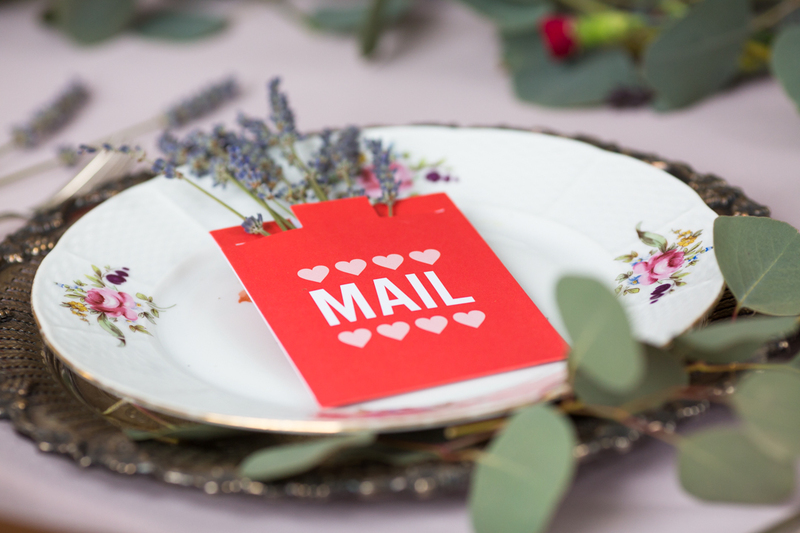 There’s absolutely nothing wrong with the traditional stark red and hot pink palette we see every year come Valentine’s Day if those colours truly make you think of your beloved. Do they wear these colours frequently or decorate with them in their home? If not, chances are that palette doesn’t evoke happiness in them. 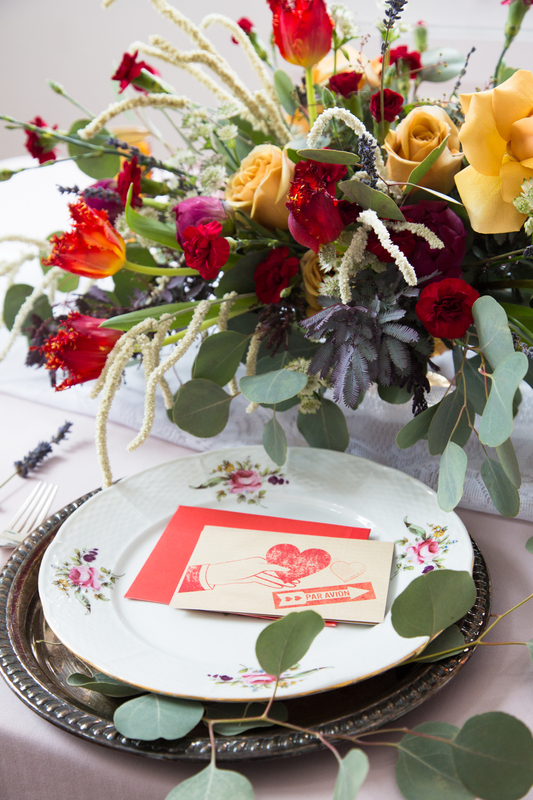 Paying attention to these details is what makes someone feel special when receiving flowers. That’s what Forgather Floral Co. is all about, not just flowers for the sake of flowers, but to express love on a personal level. 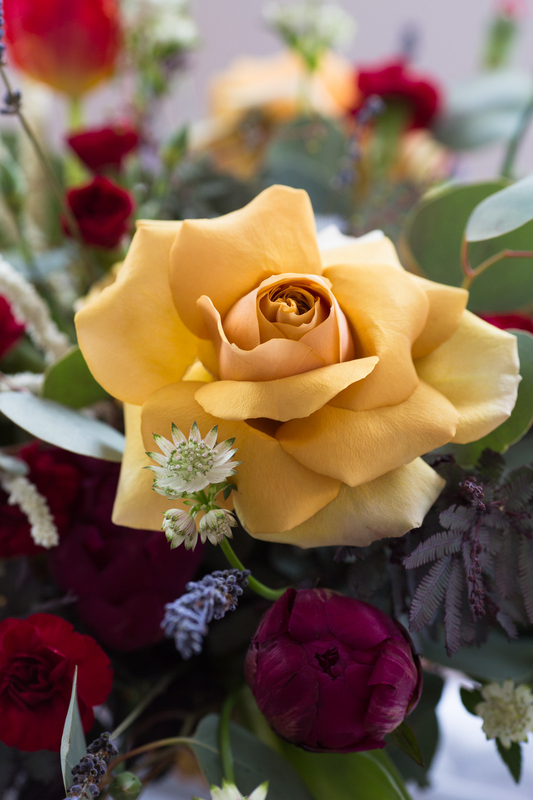 If you call Forgather to place an order and you’re not sure where to start you will be guided in the right direction and together we will be sure to find the right blooms for your recipient. 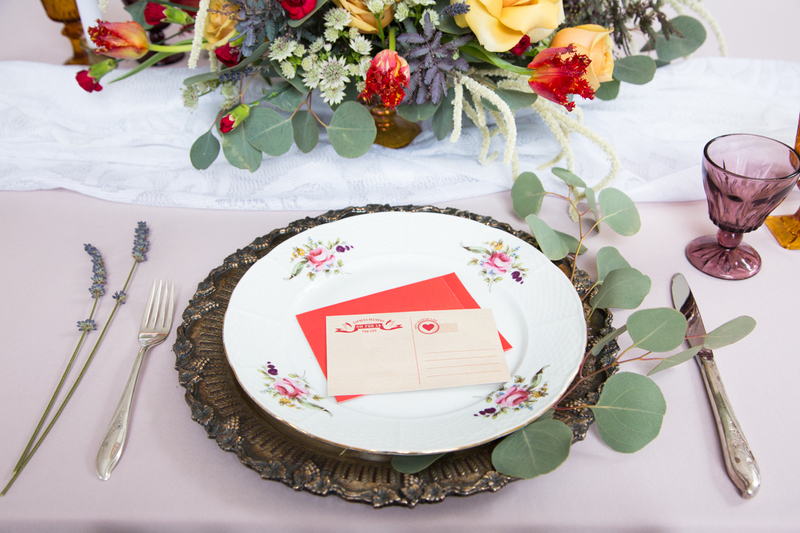 For this table setting, we went with a warm palette of gold, whites, deep reds, dark fuchsia, and silvery greens. 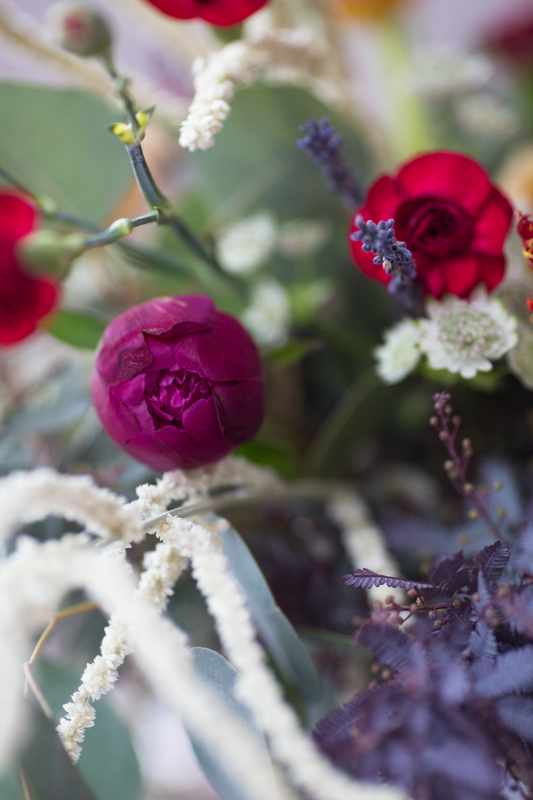 To achieve the moody tones we used white astrantia, white amaranth, blood red spray carnations, dark pink peonies, golden mustard roses, red parrot tulips and silver dollar eucalyptus with touches of purple acacia. 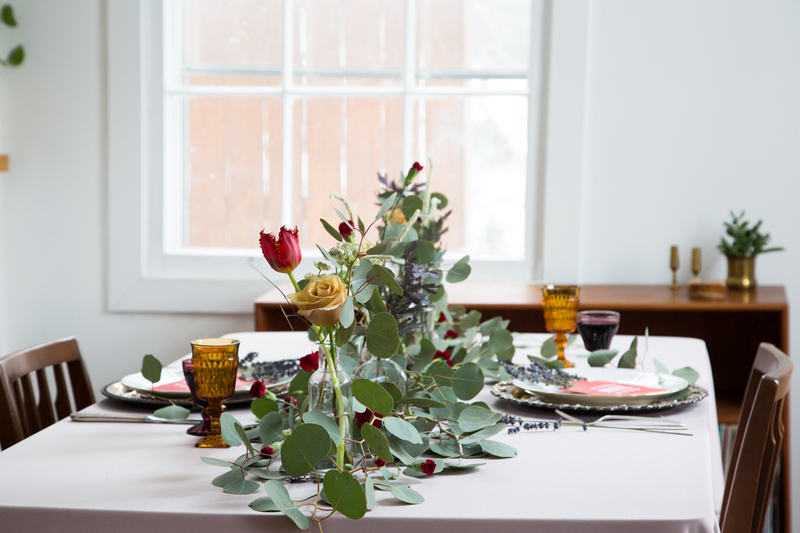 We elevated this tabletop by bringing out the vintage silver, china, and glassware, (supplied by the owner of Bohemia Jill Dyck,) rather than using the same glasses, plates, and flatware that we use every day. 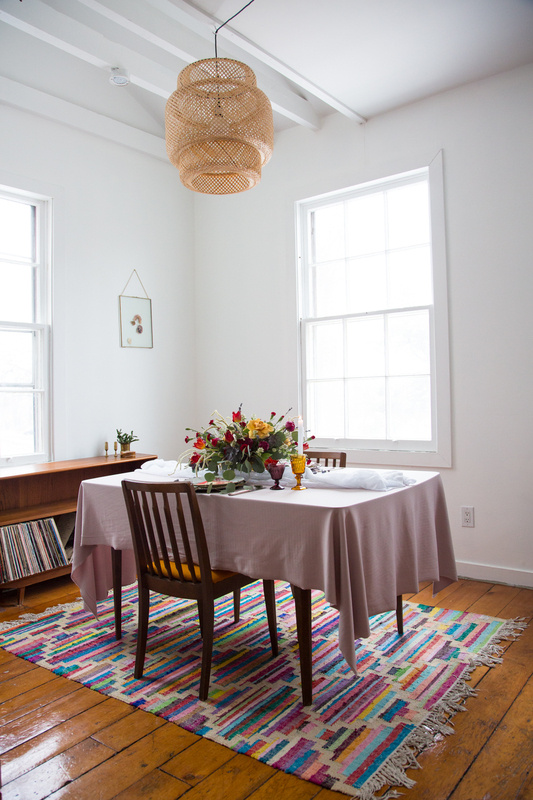 You can shop your local second-hand stores for special finds like these to make an occasion stand out from your regular dining experiences. 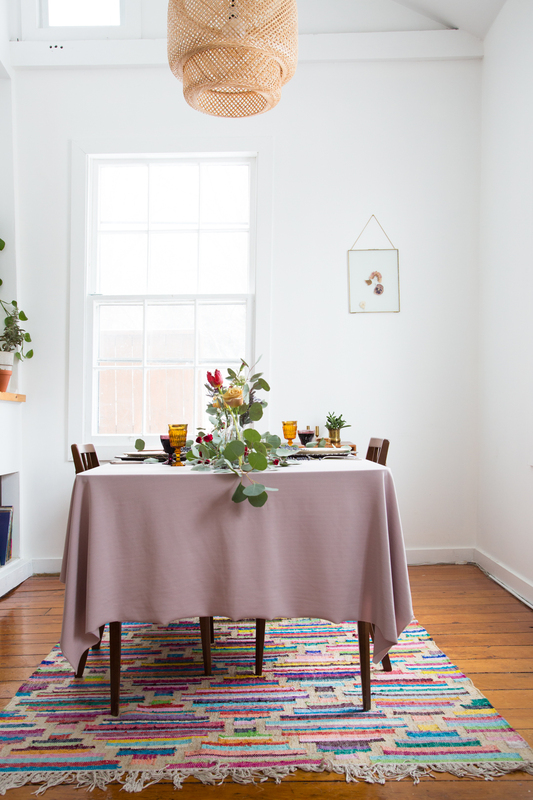 A setting like this says whatever couple sits here to enjoy a meal together has put thought, love, and care into creating a romantic ambiance. 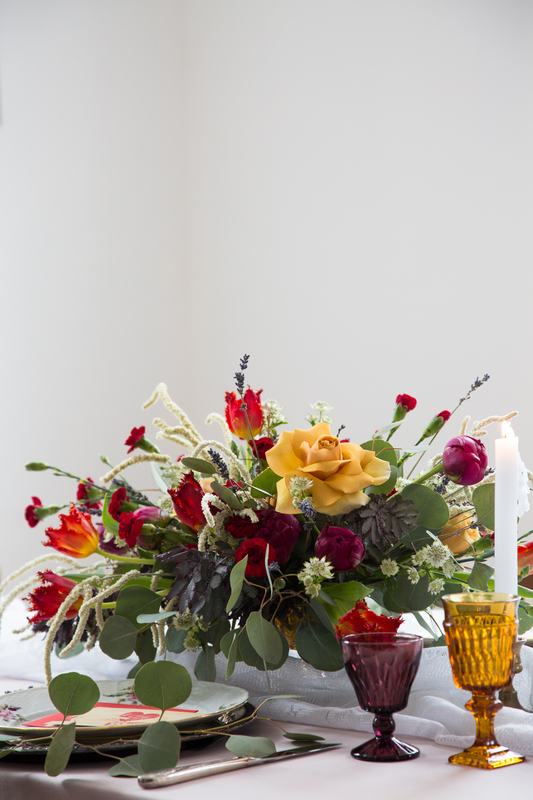 Beautiful combo of red parrott tulips, golden mustard roses, acacia and white amaranth. 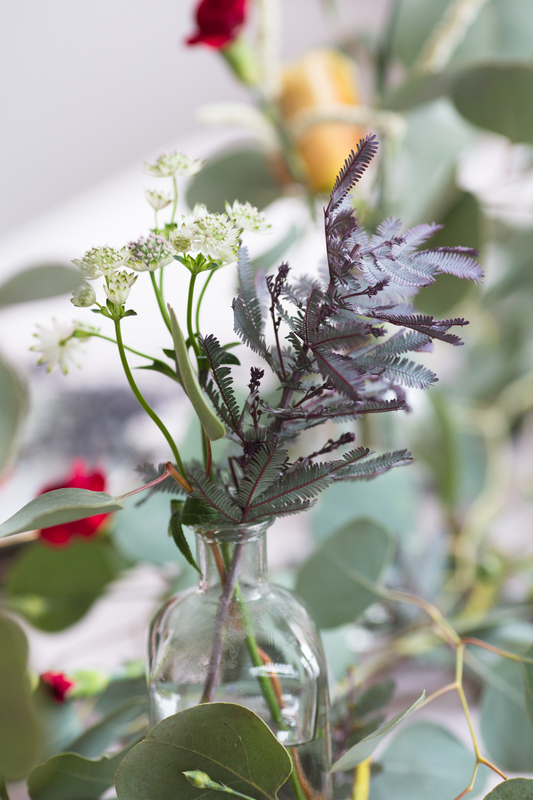 Dark pink peony, white amaranth, and acacia which is from the mimosa family. 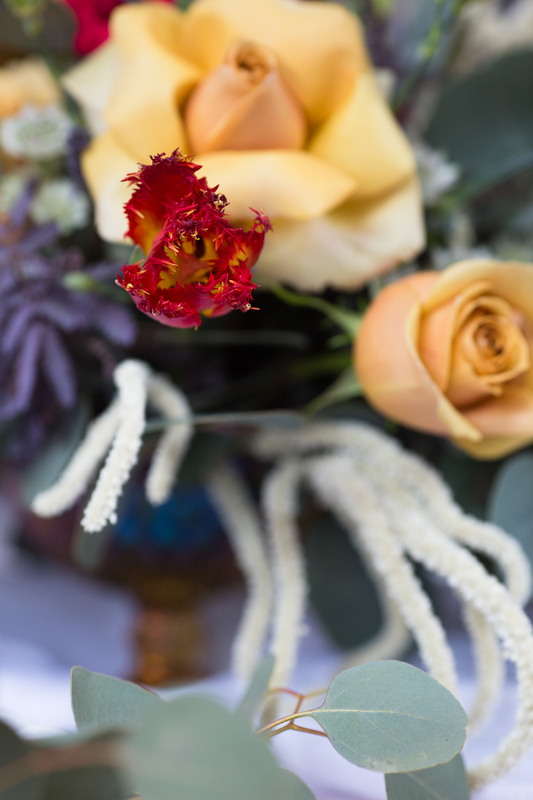 Sprigs of lavender and blood red spray carnations also complete this bouquet. 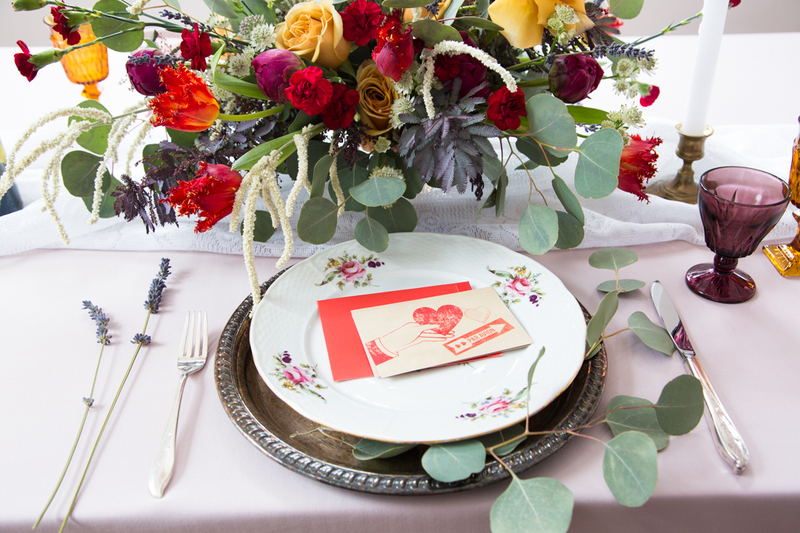 The cards that we incorporated into our table design are from the Martha Stewart Valentines Day Collection. I thought that they had a cool retro vibe to add just the right touch to our table. 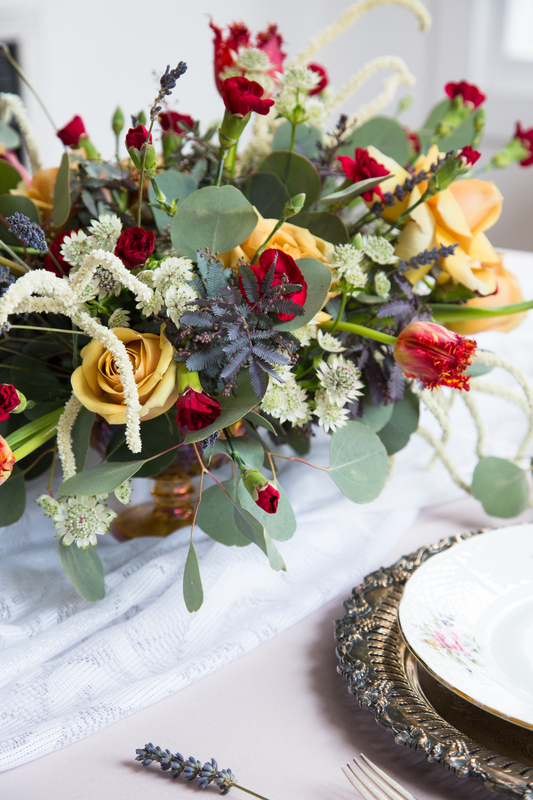 This next table design is an example of how you can make a purchased bouquet go a long way without being great at floral arranging. 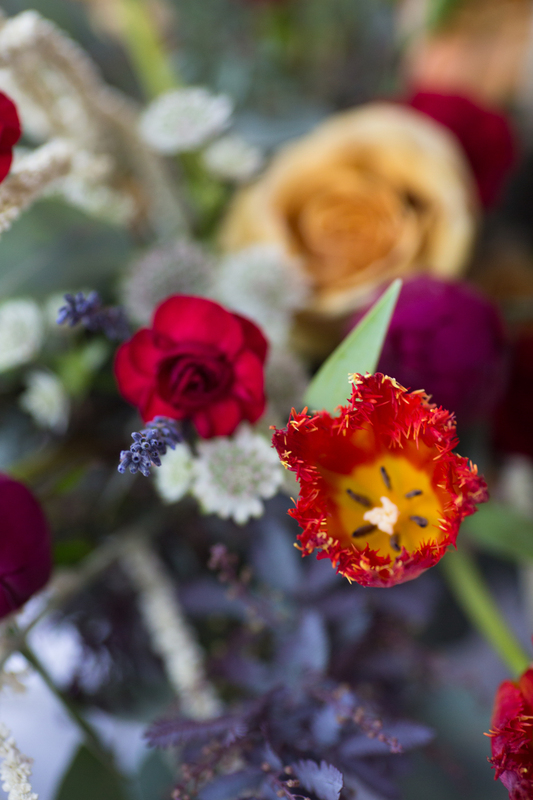 Often times people bring home lovely bouquets arranged by talented designers, place them in a vase and just aren’t getting that same wild and free vibe the bouquet had before. Often this is due to just simply not having the right vases. 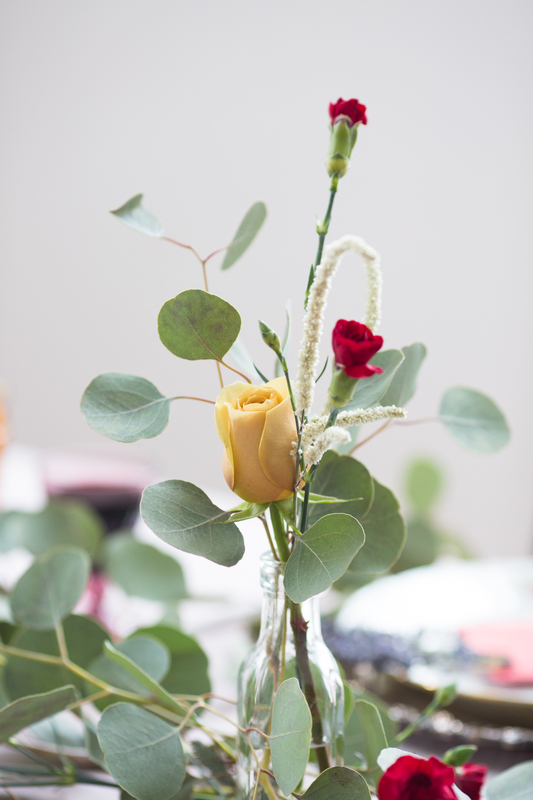 For example, a vase with a narrow opening can morph your bouquet from a loose and romantic style to an upright and stiff look. 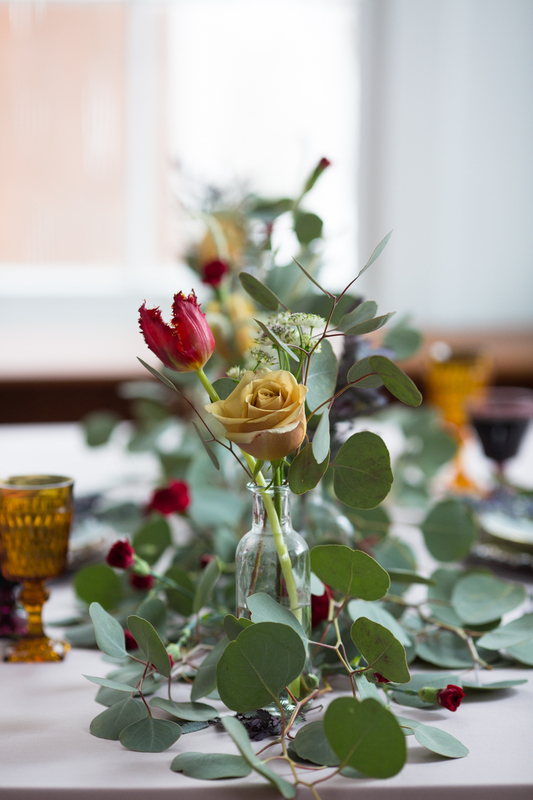 Having a collection of vintage bud vases makes the second step of bringing a bouquet home more enjoyable. 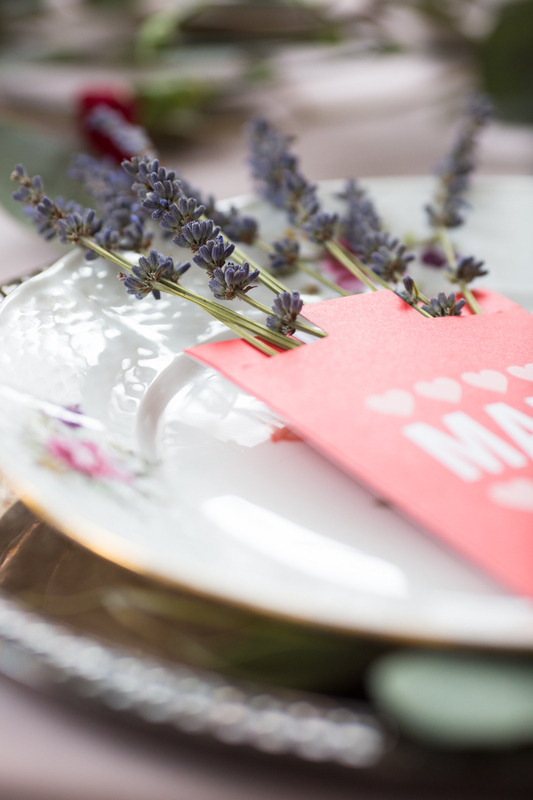 Spread them around your home or use them in a long table setting like we did here. 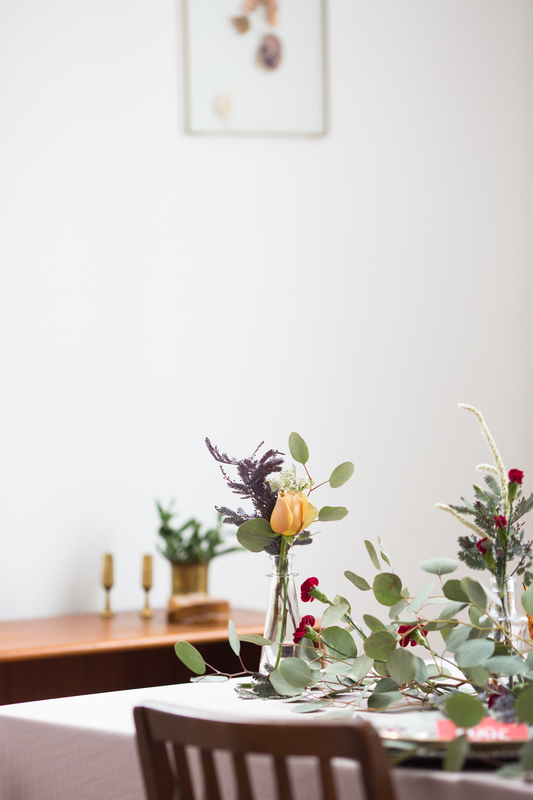 To emulate this look you may want to ask your florist for some extra greenery. 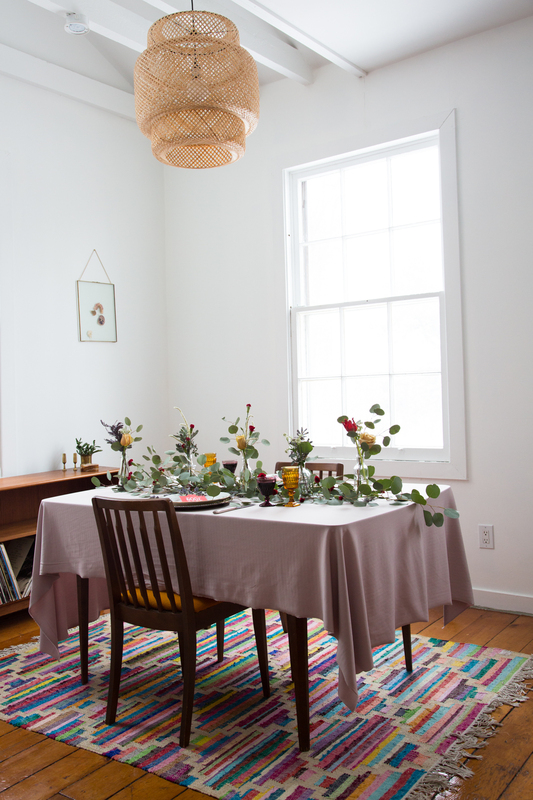 What we did was take apart the large lush arrangement from the previous look, gave all the stems a fresh cut and spread them into bud vases along the table. 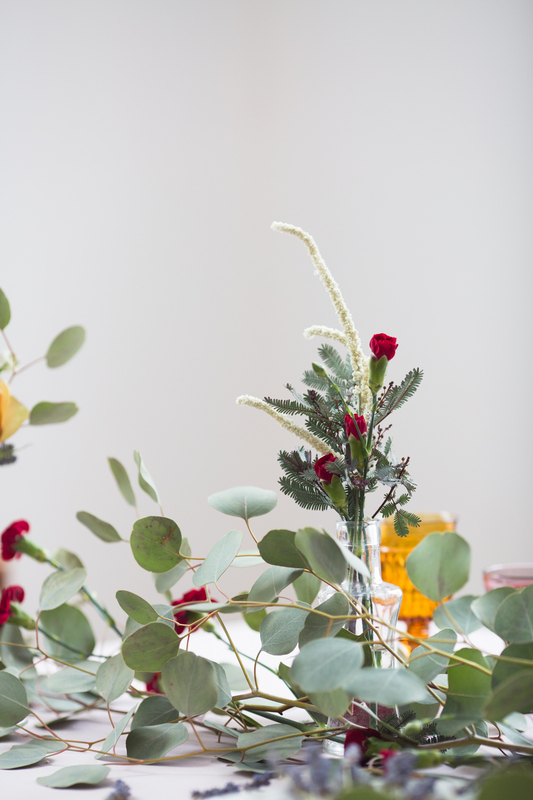 We took the greenery out of the arrangement, pat the stems dry and did a “faux” garland look by simply laying the greens along the centre of the table and spotting the bud vases throughout. 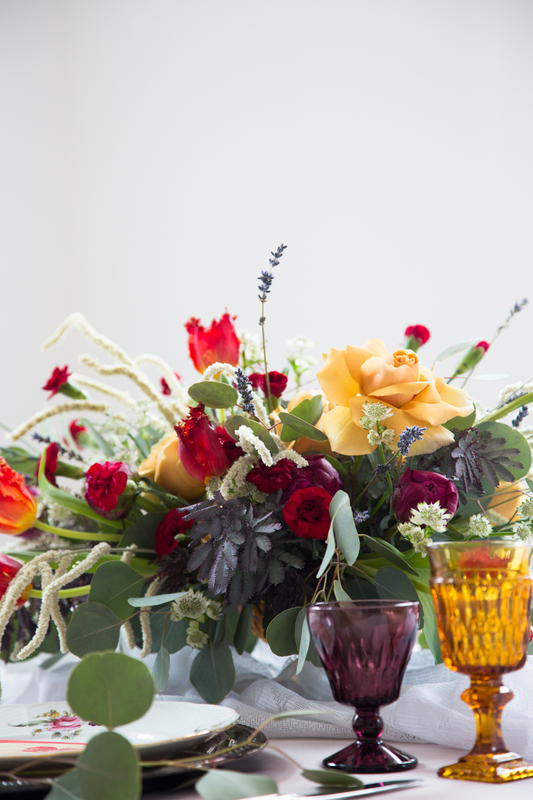 This is also a great way to make a purchased arrangement last longer. 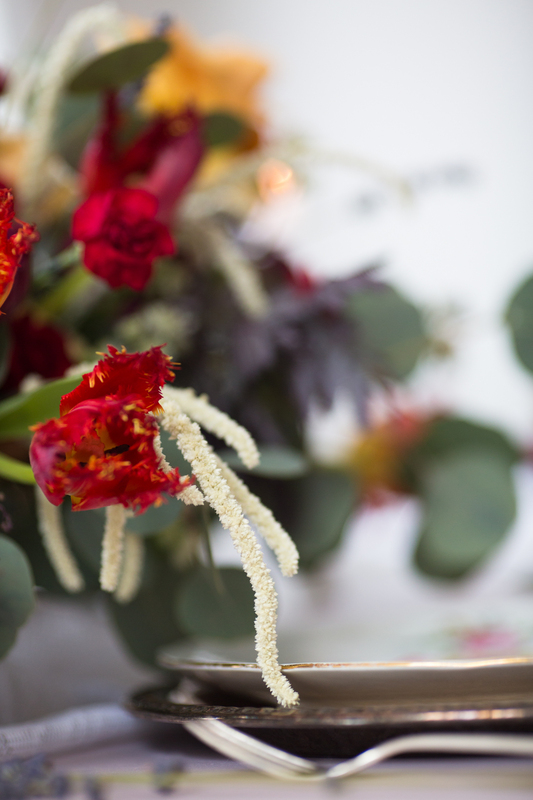 You don’t need to worry about designing an arrangement yourself when it’s been purchased in a vase, but to enjoy an extra few days of glory in your blooms, they will require a fresh cut and fresh water. 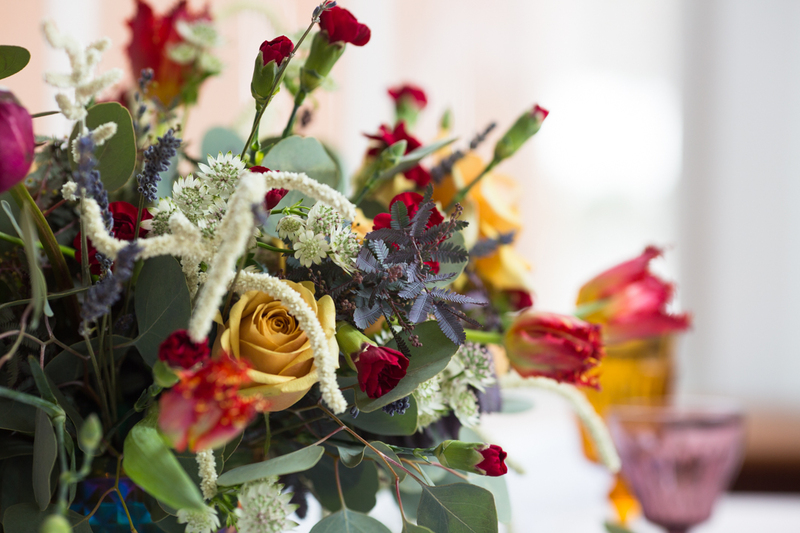 This is a great way to squeeze some more life out of those flowers before they kick the bucket! I myself do this when I see an arrangement I’m enjoying at home getting droopy. It’s wonderful to see them perk up again and you have a whole new style to enjoy for a couple days. This look requires little effort but really looks impressive and stylish. 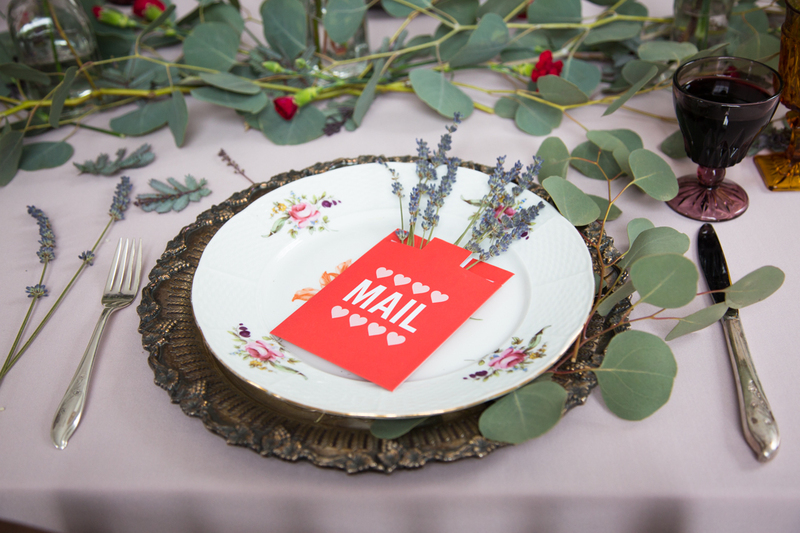 More vintage inspired cards from the Martha Stewart Collection. 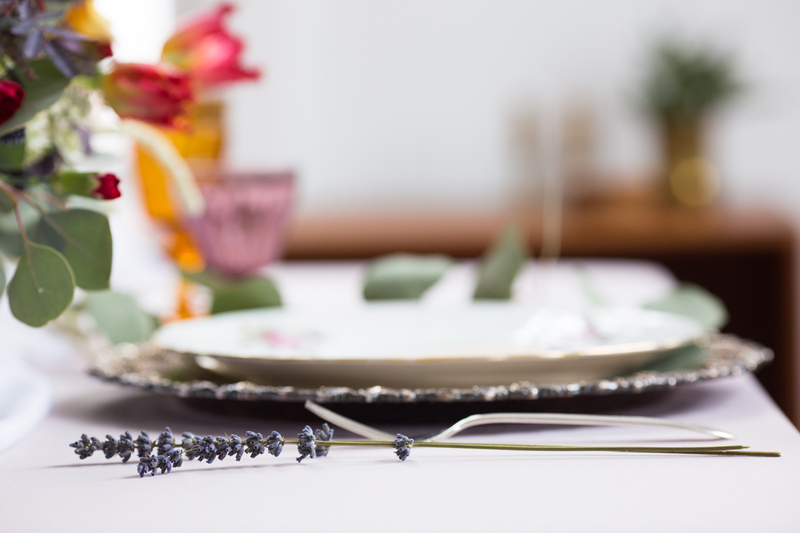 Adding some lavender sprigs to your place settings is a simple and elegant touch. 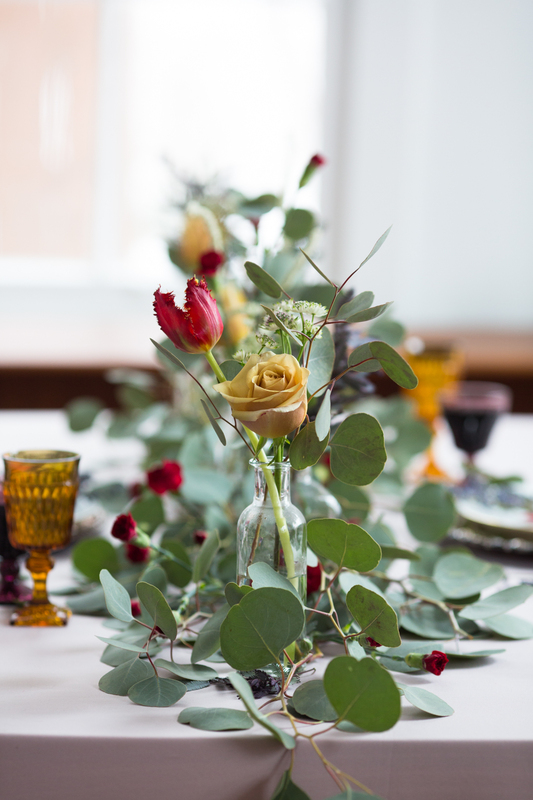 Take the greenery out of your arrangement and create a ‘faux’ garland by simply laying the greens along the centre of the table and spotting the bud vases throughout.